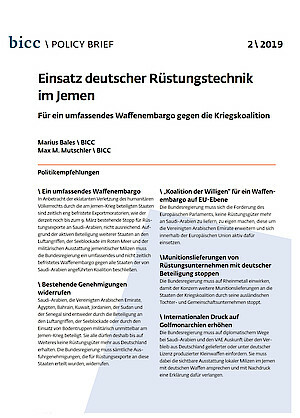 The English version of this Policy Brief is a translation of the original German version that was published on 25 February 2019. The "Khashoggi moratorium" on arms exports to Saudi Arabia, imposed by the federal government in response to the murder of the journalist, ends on 9 March. In view of the continuing gross violation of international humanitarian law by the states involved in the war in Yemen, the latest BICC Policy Brief considers a mere extension of the moratorium to be insufficient and calls for a comprehensive arms embargo against the war coalition. In view of the flagrant violation of international humanitarian law by the countries involved in the war in Yemen, export moratoria of limited duration, such as the current stop of arms exports to Saudi Arabia until 9 March, are not sufficient. Due to the active participation of other countries in the air raids, the naval blockade in the Red Sea and the military equipment of Yemeni militias, the German government must decide on a comprehensive and unlimited arms embargo against all states of the coalition led by Saudi Arabia. Saudi Arabia, the United Arab Emirates, Egypt, Bahrain, Kuwait, Jordan, Sudan and Senegal are militarily directly involved in the war in Yemen either through their participation in the air raids, the naval blockade or through the deployment of ground troops. All of them are therefore to be banned from receiving military equipment from Germany for the time being. The German government must revoke all export licenses granted for arms exports to these states. The German government must adopt the European Parliament's demand that no more military equipment be supplied to Saudi Arabia, expand it to include the United Arab Emirates, and actively support it within the European Union. The German government must urge Rheinmetall to stop further deliveries of ammunition to the countries of the war coalition by its foreign subsidiaries and joint ventures. The German government must use diplomatic channels to demand information from Saudi Arabia and the UAE about the whereabouts of small arms supplied from Germany or produced under German licence. It must address the obvious provision of such weapons to local militias in Yemen and emphatically demand an explanation.